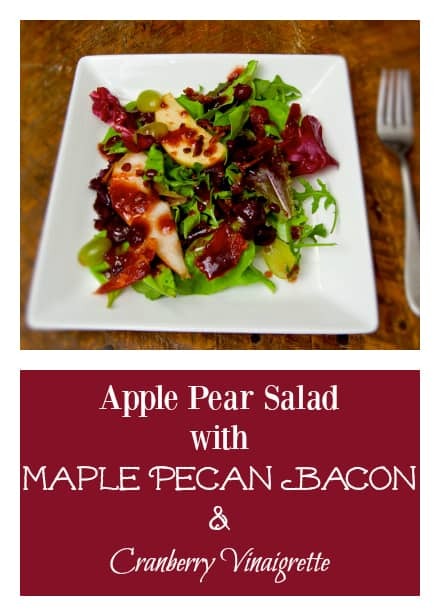 Apple-Pear Salad with Maple Pecan Bacon in a Cranberry Vinaigrette is truly a thanksgiving worthy salad! When I look at this picture, I can still taste the tangy acidity of that dressing, the sweetness of the pears and grapes, the saltiness of the bacon, and the crispness of the lettuce. I went to a slumber party with my wonderful girlfriends, and came home with the salad of my dreams: Apple-Pear Salad with Maple Pecan Bacon in a Cranberry Vinaigrette! OK, the truth is, nearly all of us bugged out after Bible study, dinner, and the hot tub, and went home to sleep in our own beds BEFORE we got to the slumber portion of the evening. I think 4 guests remained when I left. So, not much slumbering on site. And yes, I was one of the ones who hit the trail, late at night, so I could go home and sleep in the Boonies. But nearly all of us showed back up again the next morning for breakfast together, so it was ALMOST a slumber party. But at the dinner we had on Friday night, my friend Debbie had prepared a huge, glorious salad that was so good, it had all of us begging for the recipe. And then, the next day, I found that very recipe, in my brand new Southern Living 2011 Annual Recipes cookbook that had just arrived in the mail. It was listed among the very select group of the Best Recipes of 2011. And I can assure you, it earned that place of high honor. This was one of the best salads I’ve had in a LONG time. And, since it was actually published in the Southern Living Magazine during the month of October, its ingredients are very fall-friendly, making it perfect for your Thanksgiving table. I tire of green beans on Thanksgiving. I always use fresh green beans, and they are a lot of work to tip, string and break. This salad requires very little preparation (the biggest effort was in browning the bacon, but that could easily be done the day before Thanksgiving), and will make a fresh and BURSTING WITH FLAVOR addition to your holiday menu. It’s the CRANBERRY VINAIGRETTE, people. Holy molé, it’s packed with flavor. Check it out! This salad is absolutely amazing. It requires a bit of prep work, but everyone of your guests will come back for seconds, and thirds! Preheat oven to 400º. Place a lightly greased wire rack in an aluminum foil-lined jelly roll pan. Dip bacon in syrup, allowing excess to drip off. Dredge bacon in pecan pieces. Arrange bacon slices in a single layer on rack, and bake 20 minutes; turn bacon slices, and bake 5 to 10 minutes more, or until browned and crisp. Remove from oven, let stand 5 minutes, and cut bacon crosswise into 1" pieces. Place salad greens on a serving platter. Top with apple slices grapes, cheese, and bacon. 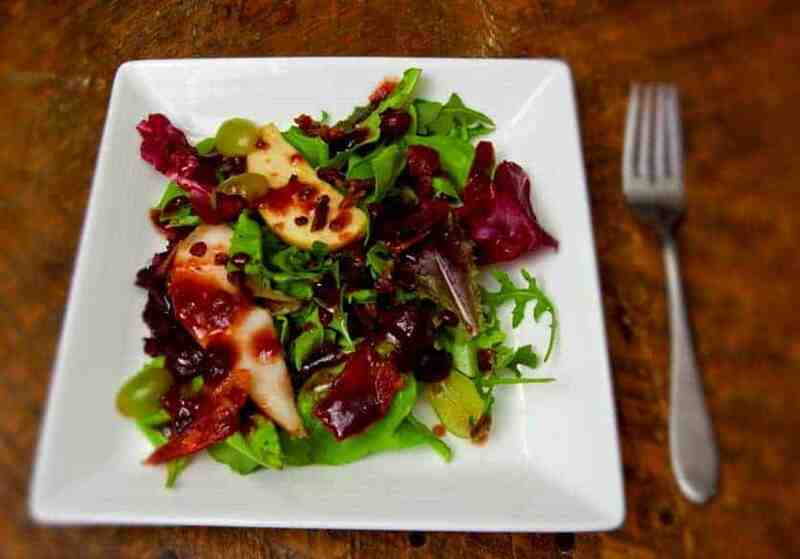 Serve with cranberry vinaigrette. I imagine this vinaigrette would be great on almost any other type of salad you’ve a mind to experiment with. But the cranberry fits the Thanksgiving holiday so well, I hated the thought of NOT telling you about it in time for the holiday. I suggest you give it a trial run before Thanksgiving, and see if you don’t decide to add this to your Thanksgiving menu. It’s spectacular! Got any side dish that you typically serve that you’d like to replace? I would love it if you’d share this recipe with your family or friends on Facebook! And even more if you’d pin it on Pinterest!